1. Preheat the oven to 180 ̊C, gas mark 4. Grease 3 x 20cm sandwich tins and line the bases with baking parchment. In a large bowl, using electric beaters, beat together the butter, sugar and vanilla extract until light and fluffy, about 5 minutes. Add the eggs a little at a time, beating well between additions. In a separate bowl, whisk together the flour, spices, bicarbonate of soda and salt. In three additions, and alternating with the buttermilk, beat the dry ingredients into the wet. 2. Divide the batter equally between the prepared tins, smooth the surface and bake for 25-30 minutes, or until golden and starting to come away from the sides of the tin. Allow the cakes to cool in their tins for 10 minutes before turning out onto a wire rack to cool completely. 3. For the buttercream, place the egg whites, sugar and a pinch of salt into a heatproof bowl and set over a pan of gently simmering water; make sure the bowl doesn’t touch the water. Using electric beaters, gently beat together until the mixture is warm to the touch and the sugar has dissolved. To test this, dip 2 fingers into the mixture and rub them together. If you can still feel grains of sugar, cook for a few minutes longer. 4. Remove the bowl from the heat and, using electric beaters (or a freestanding mixer), whisk until a thick, glossy meringue is formed and the mixture is cool to the touch. With the mixer still running, add the butter, a couple of pieces at a time, then beat in the coconut cream and flavouring until thoroughly combined. Don’t worry if the mixture collapses or looks curdled, keep mixing and it will eventually form a smooth buttercream. 5. 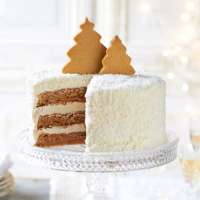 To decorate, place the first layer of the ginger cake onto a serving plate or stand, and spread with a layer of the buttercream. Repeat with the second layer of cake, then top with the third layer. To finish, spread the remaining buttercream (ideally you’ll have about 2/3 left after filling the layers) over the top and sides of the cake. Decorate with the desiccated coconut, carefully pressing all over the cake. This recipe was first published in Fri Nov 13 10:38:00 GMT 2015.